War-date Confedearte Document Signed by John Withers, AAG,1pp. quarto, Richmond, Virginia, December 24, 1861, being Special Order No. 274, issued to Major J.G. Pickett, and reads “Major J.G. 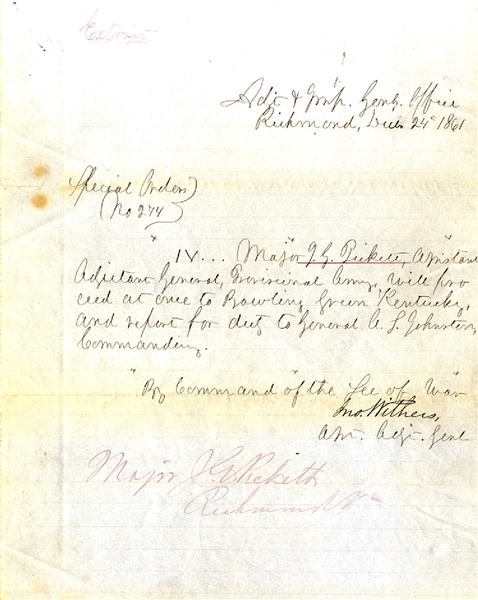 Pickett Assistant Adjutant General, Provisional Army will proceed at once to Bowling Green Kentucky and report to duty to General A.S. Johnston Commanding...” Fine condition.